In the Fife and Angus area, that part lying within the Midland Valley of Scotland is underlain by Upper Palaeozoic rocks belonging to the Devonian and Carboniferous Systems, part of the Midland Valley Block of Curry et al. (1984). Beyond the Midland Valley to the north-west lie the Scottish Highlands, underlain by much older Dalradian rocks of the Precambrian, the Dalradian Block of Curry et al. (1984). These two major areas are separated by the Highland Boundary Fault, not a simple single fault plane but rather a series of anastomosing faults between which occur fault-bounded wedges of rock seldom more than a kilometre wide. These wedges are largely composed of the rocks of the Highland Border Complex which were, until recently, thought to have an affinity with the adjacent Dalradian (e.g. Harris and Pitcher 1975). More recent work indicates that the Highland Boundary Fault is a major boundary separating 'terranes' originally far from their present position and brought together by means of very large horizontal or transform displacements. Caught up within this major tectonic boundary are the wedges or 'slivers' (Curry et al. 1984) assigned to the Highland Border Complex. Within the area covered by the guide book, fossils have been obtained from rocks of the Highland Border Complex at three levels: in Glen Esk (1) in the Margie Limestone — Upper Ordovician (Burton et al. 1984) and (2) in 'greenstones' — Lower Ordovician (Downie et al. 1971, p. 24), and at Stonehaven in cherty shales and interbedded greenstones/volcanics – probably Middle Ordovician (Curry et al. 1984). Modern stratigraphical practice (Curry et al. 1984) suggests that Barrow's (1901) terms Jasper and Greenrock Series and Margie Series as applied to the North Esk and Stonehaven sections should be dropped and the informal terms 'rock assemblage' used until such time as more closely defined terms can be set up. The terms assemblages 1, 3 and 4 allow comparison with the better documented Aberfoyle area and are used below with the older Barrow terms in brackets for convenience. A wide variety of rock types are found in Rock Assemblage 1 including serpentinite; Rock Assemblage 3 contains black shales, cherts and volcanics, e.g. pillow lavas (Barrow's Jasper and Greenrock Series), and finally Rock Assemblage 4 comprises breccias, conglomerates and arenites and, in Glen Esk, limestone (Barrow's Margie Series). 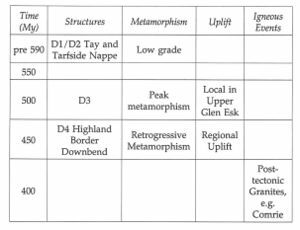 The complex is younger than both the Tay Nappe and the peak of regional metamorphism in the Dalradian see (Table 2). The complex is made up of a wide range of lithologies brought together in a series of fault slivers, and ranging in age through most of the Ordovician and according to Rogers et al. (1989) Lower Cambrian. Omitting for the moment the Cambrian, the Highland Border Complex has a varied stratigraphical history corn-prising an older pre-Arenig serpentinite complex, overlain unconformably by carbonates (in the Aberfoyle area), conglomerates, black shales, cherts and volcanics of Lower and Middle Ordovician age. These in turn are overlain unconformably by Upper Ordovician arenites, shales, limestones and conglomerates. The sequence occurs along the important boundary between a poorly known Midland Valley basement, a possible source of much of the Highland Border Complex sediments, and the Dalradian rocks of the Highlands. The rocks of the Highland Border Complex may well have been formed in an oceanic marginal basin with the sediment source on the south-east side. 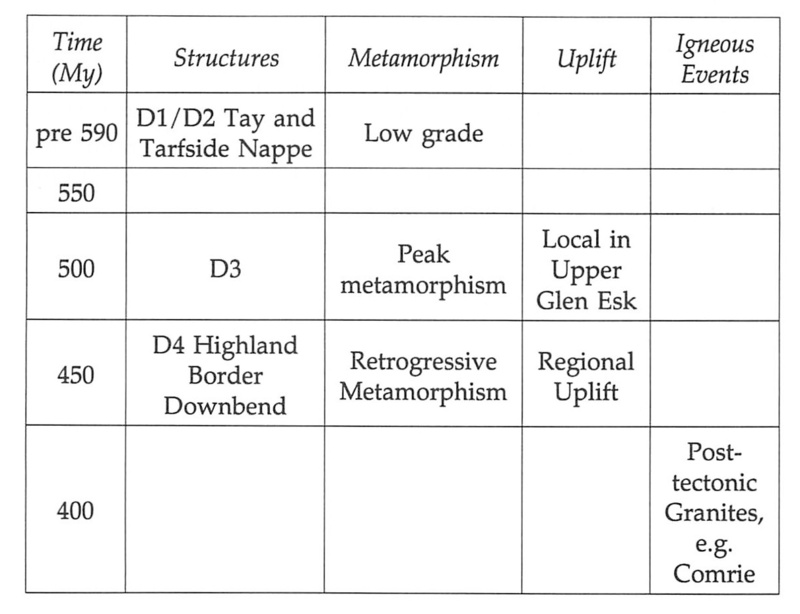 Of the adjacent Dalradian rocks there is little or no evidence until near the end of the Lower Palaeozoic, a time of Dalradian uplift and retrogressive metamorphism and the formation of the Highland Border down-bend see (Table 2), and it seems likely that only at this time did the rocks of the Dalradian and the Highland Border Complex come together as a result of major transcurrent faulting (Harte et al. 1984, p. 162). Such major transcurrent faulting may also have been responsible for the introduction of the Cambrian Leny Limestone to the Callander area further west. BARROW, G., 1901. On the occurrence of Silurian (?) rocks in Forfarshire and Kincardineshire along the eastern boundary of the Highlands. Quart. Jour. Geol. Soc. Lond., 57, 328–45. BURTON, C. J. et al., 1984. Chitinozoa and the age of the Margie Limestone of the North Esk. Proc. Geol. Soc. Glasg., 124/125, 27–32. CURRY, G. B. et al., 1984. Age, evolution and tectonic history of the Highland Border Complex, Scotland. Trans. Roy. Soc. Edinb., Earth Sci., 75, 113–33. DOWNIE, C. et al., 1971. A palynological investigation of the Dalradian rocks of Scotland. Rep. Inst. Geol. Sci. Lond., No. 71/9. HARRIS, A. L. and PITCHER, W. S., 1975. The Dalradian Supergroup. In HARRIS, A. L. et al., A correlation of the Precambrian rocks of the British Isles. Geol. Soc. Lond. Spec. Rep. 6. HARTE, B. et al., 1984. Aspects of the post-depositional evolution of Dalradian and Highland Border Complex rocks in the Southern Highlands of Scotland. Trans. Roy. Soc. Edinb., Earth Sci. 75, 151–63. ROGERS, G. et al., 1989. A high-precision U-Pb age for the Ben Vuirich granite; implications for the evolution of the Scottish Dal-radian Supergroup. Jour. Geol. Soc. Lond., 146, 789–98. This page was last modified on 23 February 2019, at 17:13.